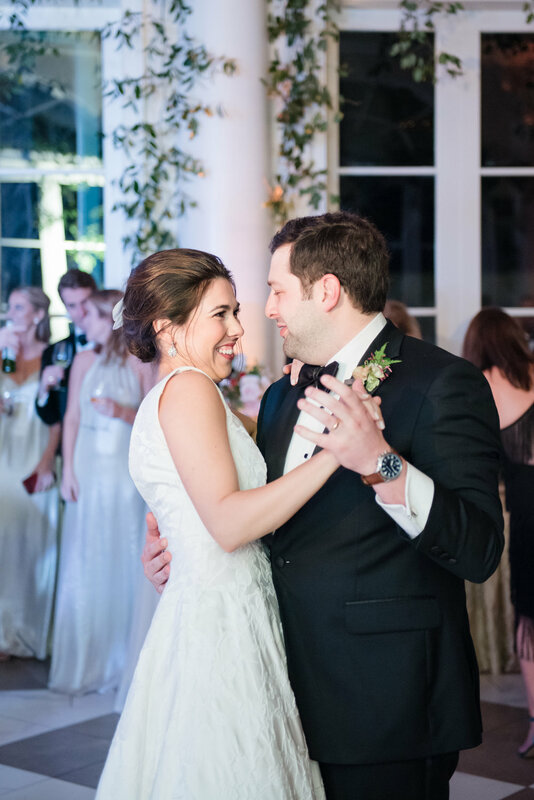 Abbey and Louis were married in an early Fall wedding at Christ Cathedral Church, followed by a reception at the Chicory. Check out their story, in their own words, below! We actually met at a wedding. Louis was the best man, and I was a friend of the bride - passing out brochures & manning the guest book. We met at the rehearsal dinner, but didn't hit it off until the after-reception party the next night. We kept in touch and dated long distance before I made the move to Georgia, where we now live. We were in Birmingham, AL, for a friend's 30th birthday around New Year's. Little did I know he had been planning a surprise proposal at the Botanical Gardens there. The Gardens were across the street from our hotel, so we decided to go walk around to "kill time" prior to the birthday party. Louis had a friend go out there and set up the location for us and take photos of our special moment. We had been talking about getting married for a while, but it was a total surprise. We got to spend the rest of the weekend celebrating the new year and our new life together with friends. 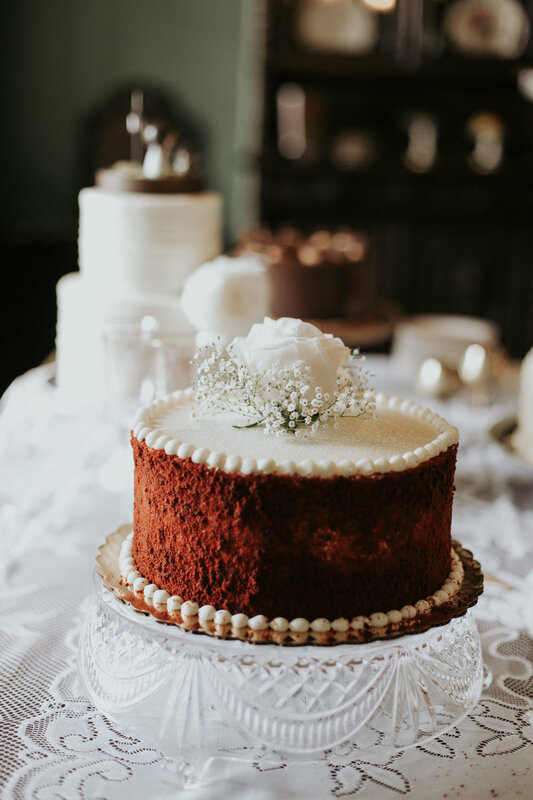 What was your favorite part of wedding planning? Our time spent in New Orleans! Louis's family is from Houma, so we took our opportunities there to spend time in the city and bring our families together to meet and be part of the planning process. 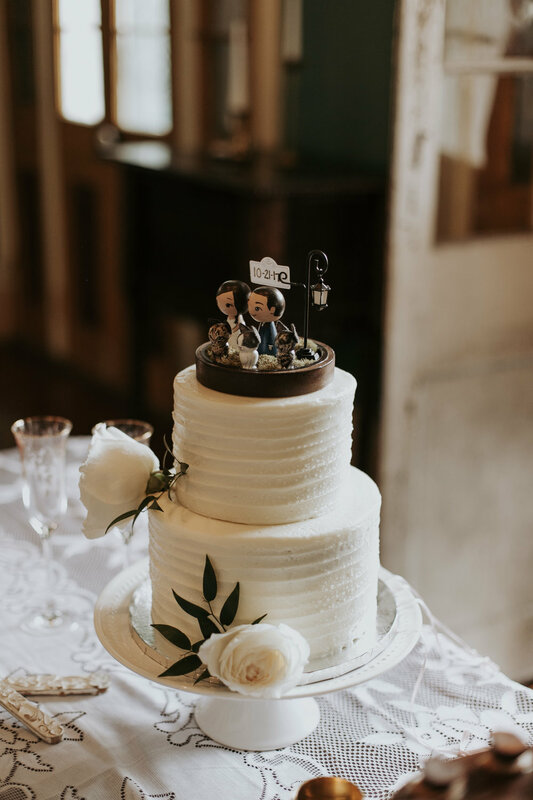 We love traveling to New Orleans, so it was important to us to incorporate that energy into our wedding for those that have never been. We made a point to work with vendors that not only knew the city, but captured some of that same vitality. Probably just the time and money spent. All throughout the process, we tried to be evaluative of what we needed and what we could live without, and while we loved everything that we chose and would ultimately have changed very little, the energy put into making those decisions is exhausting. Favorite memory of the wedding day? I think just having our friends and family show up for us in a way bigger than we ever could have imagined. Most everyone had to travel to get to New Orleans, and we had very few that weren't able to make the trip. Those that came were genuinely supportive, loving, and literally cheering us on throughout the day. 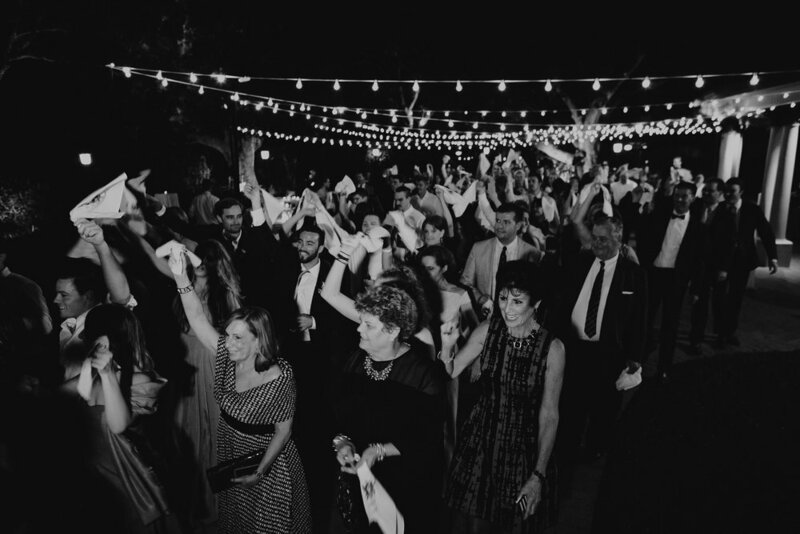 There was a moment as our reception was winding down, and our second line ended in a dance party in the middle of Fulton Alley, and Louis and I got to get a bird's eye view all of these people that mean so much to us. Try to have fun with it, and make it your own. Pick 2-3 things that are the MOST important to you for the day, and focus on those as you plan. The rest will fall into place, and you can adjust your budget and energy and accordingly. Also, rely on your vendors. Prior to the day of, just make sure you know who is going to be where, but for the most part, your vendors will be the ones that usher you through the day so you don't have to think so much about the timelines. Elizabeth and Patrick were married in late February at Rayne Methodist Church, with a reception following at Marche. 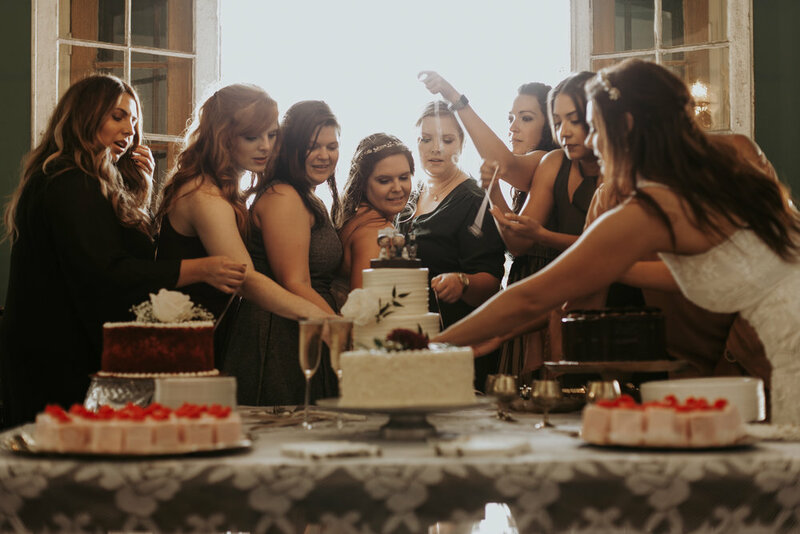 This was the second wedding I’ve had the honor of planning for this family, and it was just as much fun as her sister, Susannah’s wedding, the year before. 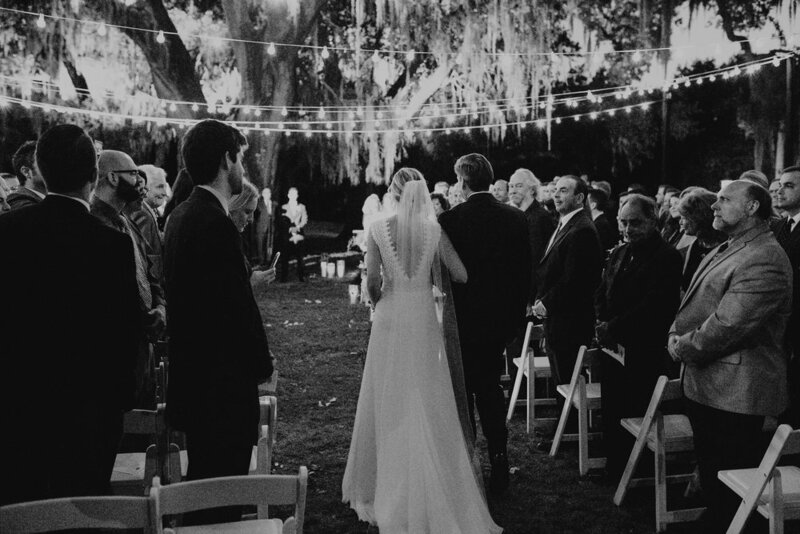 Yes, they planned two weddings less than a year apart! Since I already knew Elizabeth pretty well from planning Susannah’s wedding, and I knew her parents very well, there was none of the “getting to know your client stage.” I already knew what they liked, how they liked to do things, what they worried about, etc. It was awesome being able to go through this with them a second time, and really enjoy all the time we had together—I think overall there was less stress and worry, seeing that they had just been through a wedding, trusted me, trusted our other vendors, and were pros at this! I think I talked to at least one member of the Howard family at least once a week for close to two years! All that to mean when the wedding arrived, I was especially excited to see these vows, because I truly felt like we were all good friends. The only one I didn't know well before this wedding was the groom, Patrick. From the first time I met him I could tell he was such a sweet, genuine, and laid back guy, and these two are perfect together! The ceremony was at Rayne Methodist, the same church Susannah and Karl had been married in. 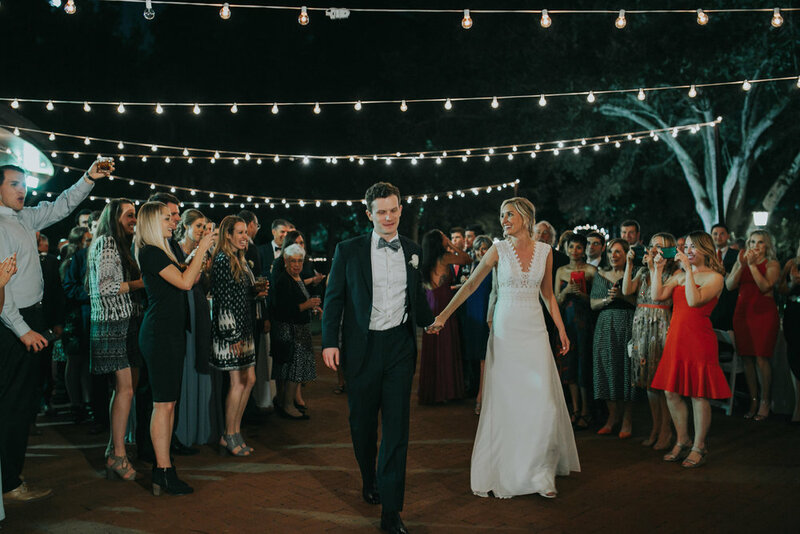 I loved the look on Patrick’s face when he saw Elizabeth walk down the aisle, and I definitely got a little teary-eyed sending off Elizabeth and her dad, Jonathan down the aisle! The reception at Marche was a blast! 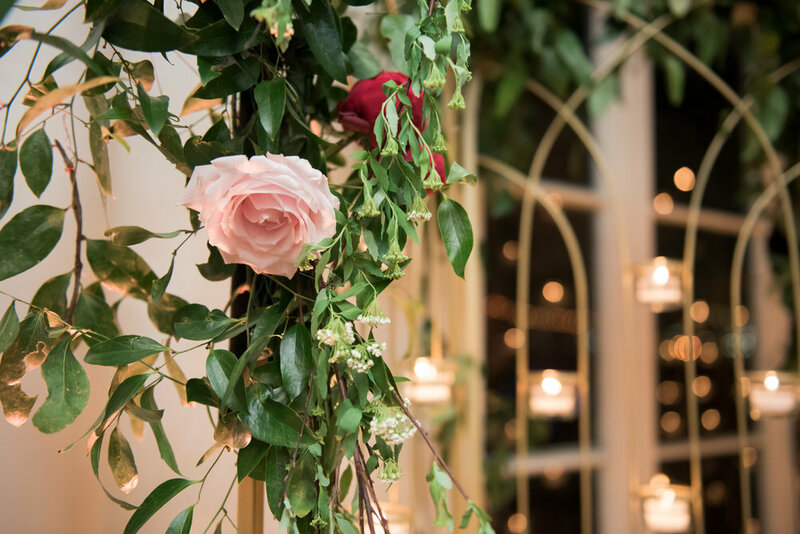 The venue was stunning, with greenery and lighting everywhere, by Poppy & Mint & Luminous Events. Elizabeth and Patrick seemed so calm all day, and were just so joyful and happy. After the party got going, we passed around glow sticks and glowing head pieces, which everyone had so much fun with. By the end of the night, the bride and groom were on the stage dancing. I loved looking through these pictures and reminiscing about how much FUN everyone was having! Truly one of my favorite weddings I’ve been a part of! 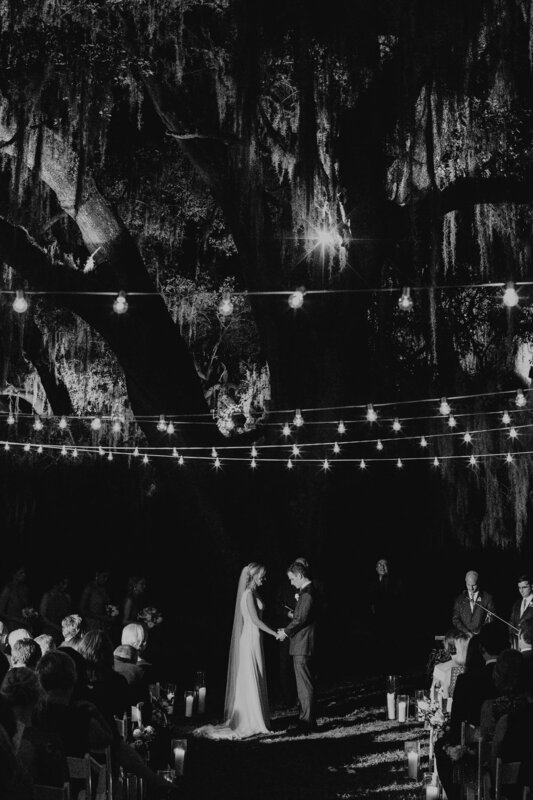 Katie and Dylan were married in a dusk ceremony at Audubon Park, with a reception following at the Audubon Tea Room. Katie is probably the most relaxed and calm bride I have worked with. She was so sweet, and I knew the first time I met her that she would be able to truly enjoy her wedding day. I didn’t end up meeting Dylan until their wedding rehearsal. He showed up wearing a white tux with hearts all over it, calling himself the King of Hearts. I was wondering how Katie would react. When she showed up and saw him dressed like that, she just smiled and laughed! These two really are the perfect complement to each other, and seem to have so much fun together. 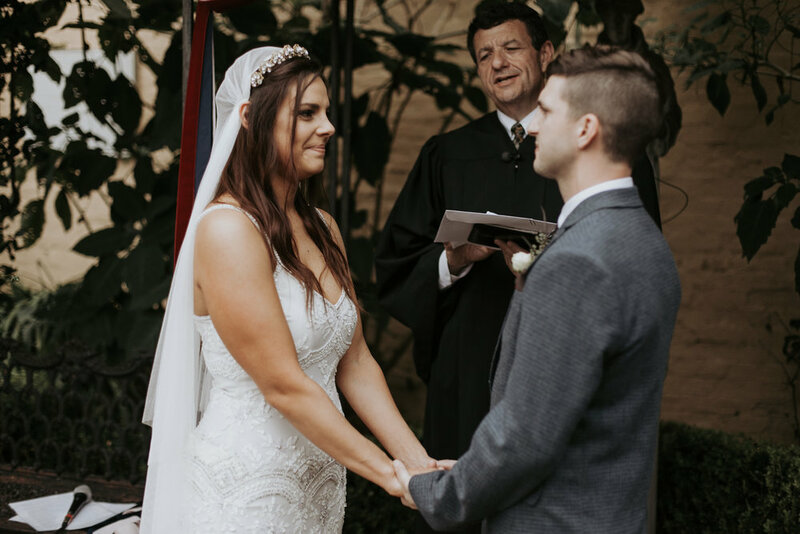 The ceremony was officiated by Katie’s childhood pastor, and I love when a couple is able to use an officiant that knows them and makes the ceremony personal. The couple was announced into the reception by two of Dylan’s cousins, which was another personal touch. Everyone had a great time dancing all night in the courtyard behind the Tea Room. 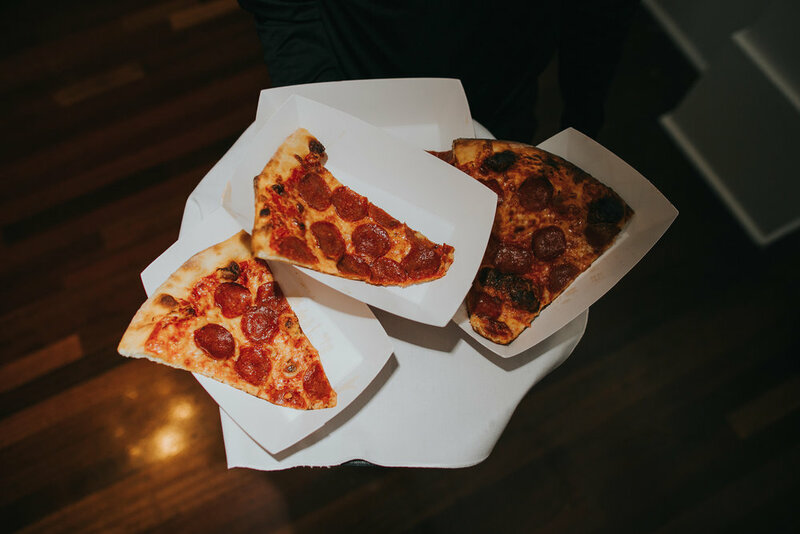 Towards the end of the night, Pizza Delicious delivered some pizzas, and that was a big hit. For their exit, Dylan had reserved an Uber Black. When the car didn’t show, despite me calling numerous times that night, I ordered them another Uber. Their second Uber arrived, and although I can’t remember the exact model, it was ridiculously tiny and not at all a wedding exit car. Katie and Dylan thought it was hilarious, and piled into the back of the car with a leftover box of Pizza Delicious. Katie’s mom told me it was perfectly unperfect, just the way they liked things! And their original Uber did show up, just as they were driving away! Congratulations to Dylan and Katie! 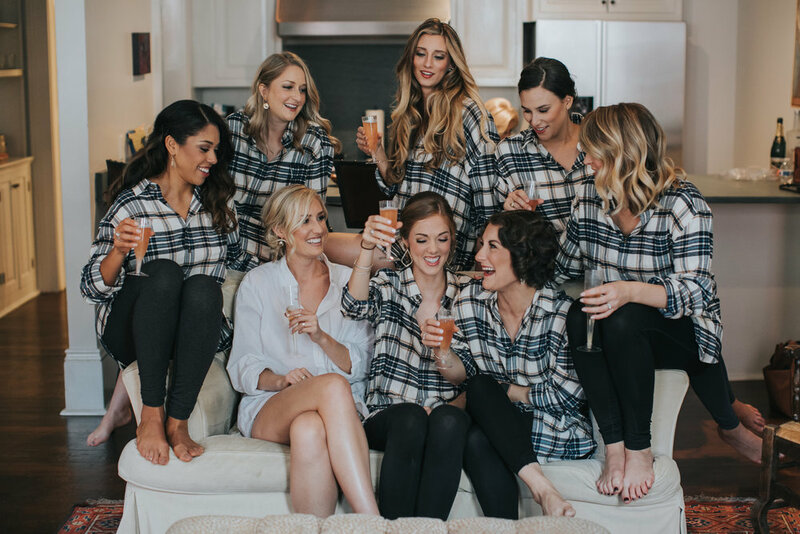 If you think a brunch wedding may be too tame, I have a few words for you- mimosas, Bloody Marys, and day drinking! This was my first true brunch wedding (I’ve done a few day time weddings before), and I’m now a huge fan! Andrea is a planner, and was definitely the most organized bride I have ever worked with, which made my job easy! She and Andre are also two of the nicest people I have met, and I couldn’t be happier for them! The rain plan all along had been to move the ceremony inside the BK House. Rain was forecast all week, and a few days before the wedding, Andrea changed her mind and decided she wanted to get a tent. Of course, that close to the wedding, and in prime wedding season, all the tents were booked. We both started calling all the companies in town and finally found an available tent, which went up in the back courtyard. It looked like it was going to rain all morning, but nothing ever happened, so the ceremony was able to take place outside as originally planned. The rain held off for the rest of the day. All the guests moved into the BK House after the ceremony for brunch and mimosas. 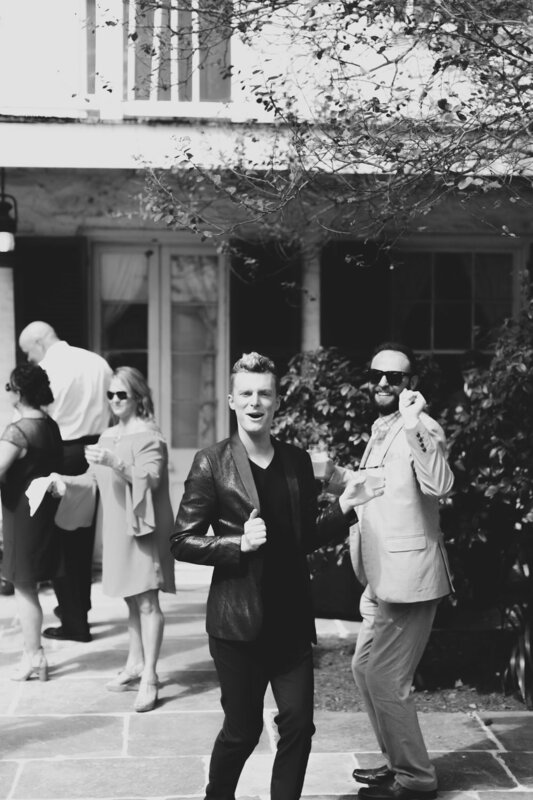 Once the DJ kicked up, everyone started dancing, and the day drinking continued. These two had a great group of family and friends and everyone was having so much fun! Congratulations to Andre and Andrea! 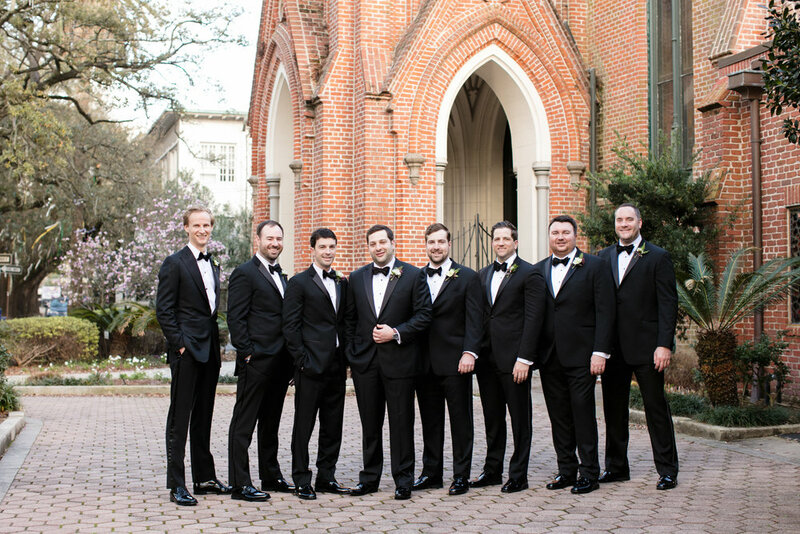 Michelle & Adam were married in an early March wedding ceremony at the Sea Lion Exhibit in Audubon Park, followed by a reception at the Audubon Tea Room. Throughout the planning process, I got to know Michelle and her mom Denise really well, and they are one of my favorite mother-daughter duos! Denise was so excited about every little detail, but always deferred to Michelle on what she wanted. After this wedding was over and all the constant planning, I really missed these two! Michelle & Adam are one of those couples that I could tell right away are perfect for each other. You can tell they are best friends, and seem have a great time together! During the wedding ceremony, a peacock flew up into one of the live oaks around the Sea Lion Exhibit and decided to start making some noise! Despite our best efforts, we can’t plan out everything! After the ceremony, Papa C & the Slammin’ Horns secondlined all the guests to the Tea Room for the reception. 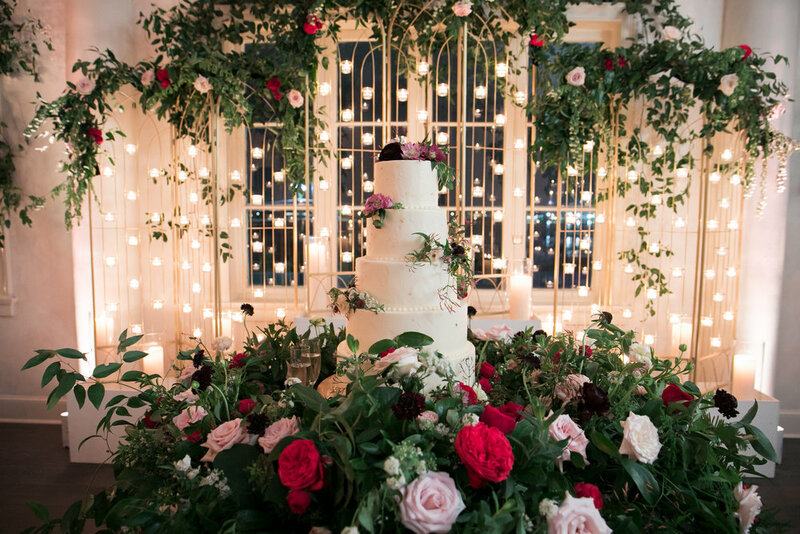 The Tea Room looked elegant with a gray color palette, and florals by Nola Flora, which were very natural in just whites and greens. 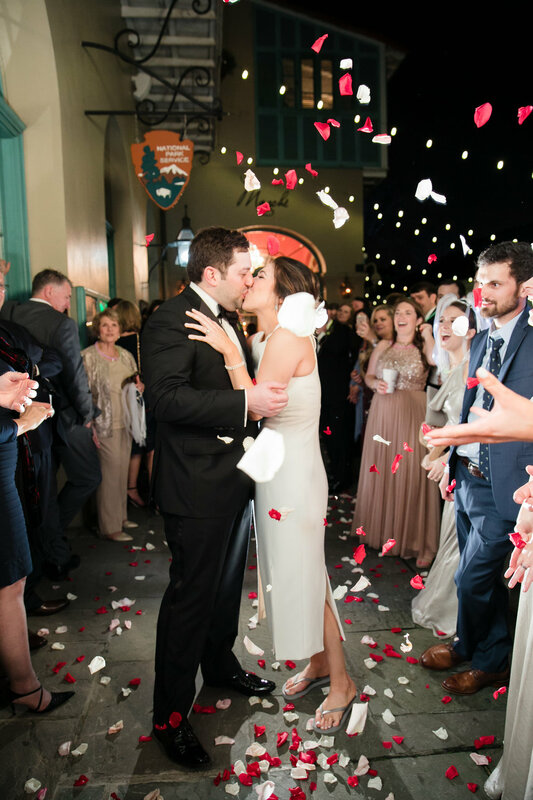 At the end of the reception, guests sent them off with a rose petal exit. Congratulations to Adam & Michelle!